We often think of Jesus' ministry as teaching to the multitudes, feeding the 5,000, teaching in the temples and synagogues, teaching on the mountainside or the seashore. But many of His most personal teachings were done within the walls of a family's home. His followers invited Him into their personal spaces, and He blessed them, healed them, and performed miracles for them.So it is today. When we invite Jesus into our homes, we will also be blessed and healed and see miracles. 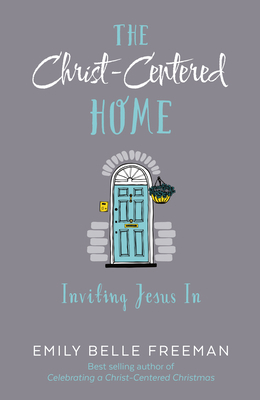 Best-selling author, Emily Belle Freeman invites readers to create a more Christ-centered home through a series of twelve stories featuring Jesus teaching in the home, including the houses of Zaccheaus, Jarius, and Peter and houses in Galilee, Jerusalem, and Capernaum.Freeman encourages families to experience a Christ-centered conversation, connection, and celebration. She writes, "Maybe you could set aside one night every month for your family to discuss an attribute of Jesus Christ and a lesson He taught within someone's home. Then you could set a family goal that would allow your family to connect personally with that lesson, and you could end the evening with a simple celebration. "Invite Christ into your home and allow Him to make your home a home of refuge, grace, and joy. Emily Belle Freeman is a sought-after inspirational speaker. She co-authors a blog about putting faith into everyday acts at www.multiplygoodness.com. She's a coach's wife and mother of four.